Check back in the next 90 days for the new auctions listed. Attendees are in for a real experience at this year’s Signature Chefs Auction. 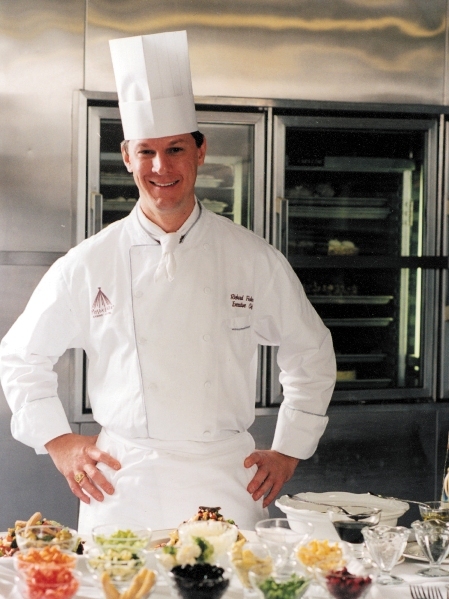 Honorary Chef Richard Fisher is the Executive Chef at Mystic Lake Casino Hotel. He has almost 30 years of experience in the culinary industry which began when he was in high school at a café making donuts from scratch. Along with having the experience as a father and husband, it was only natural for him to accept the role. He is no stranger to this event. He has been a participant for over five years. He became involved because he was asked by another honorary chef and this year he was thrilled to take on a leadership role. He wants to help babies be born healthy. “I am honored and excited to be involved,” Richard says. Chef Fisher is a pro at overseeing large events. He participates in four benefits a year, one being the Signature Chefs Auction. At Mystic Lake Casino Hotel, he is in charge of 14 restaurants and a staff of over 200 people. At Mystic Lake, you can choose a variety of cuisine including a Vegas-style buffet and an Italian steakhouse. One thing is certain; no matter what the food is; he enjoys bringing out the natural flavors to please every palette. Richard is married to Maggie, and has two sons, Josh, 15 and Zach, 3. Their family would not be complete without their miniature dachshund named Choco-latte. Perfect for a chef’s family! “I am very happy to be involved in this great event for a great cause with a lot of great chefs,” Richard says. Don’t miss out on your opportunity to sample Richard’s favorite dish, along with other top chefs in the TwinCities on September 29th at McNamara Alumni Center. For more info on how to puchase tickets visit our website. Now in its 30th year, the Celebrity Chefs Cook Gala, benefiting the UC San Diego Moores Cancer Center, is one of San Diego’s premiere fundraising events. Held again at the Sheraton San Diego Hotel & Marina, this year’s gala showcases award-winning local and out-of-town chefs who present signature hors d’oeuvres paired with fine wine at the chefs' reception prior to an elegant dinner. The “Celebrity Chefs Cook” Gala evening begins at 6:00 PM with a reception, as our approximately 450 guests visit the chefs’ stations to sample hors d’oeuvres that are each paired with a different complementary wine donated by a winery or distributor. This year, the "Spirit Award" will be presented to Iris & Matthew Strauss for their incredibly generous support of the Cancer Center which will encourage and inspire the pursuit of excellence in patient care and research. The evening concludes as guests dance the night away. The Times-Picayune ArchiveEmeril's bar is small relative to the rest of the restaurant. But it's well-equipped to serve diners the multicourse treatment. Hours: Mon.-Fri., 11:30 a.m.-2 p.m.; daily, 6-10 p.m.
Prices: Beer, $6-$8; wine by the glass, $8-$17; cocktails, $8-$14. Crowd: Tourists sit elbow to elbow with well-heeled business people. Twenty-plus years into its star-making run in the Warehouse District, Emeril Lagasse's flagship restaurant still feels like the place to be, sometimes even on Monday nights. Emeril's bar is small relative to the rest of the restaurant. But it's well-equipped to serve diners the multicourse treatment. It is also at the center of the action. Tip: Emeril's wine list is among the deepest you'll find in any restaurant in America. Ask a sommelier to direct you to the best by-the-bottle buys. More on dining at Emeril's. In this latest College Humor parody bit, maniacal muggle Guy Fieri heads to Hogwarts to watch Harry Potter potions professor Severus Snape whip up a batch of polyjuice potion. Fieri provides his usual highly boisterous (and often rhyming) commentary about "shredded boomslang skin" and "home-stewed lacewing flies," though he's a regular Neville Longbottom when it comes to proper potioning. Uh oh — Snape is apparently up to no good. Fake Guy Fieri must not be a Harry Potter nerd, or else he would have known that polyjuice potion lets the user assume someone else's form. Why Snape, or really anyone, would want to pose as Fieri is a mystery. However the professor's mincing malevolence suggests he would make an awfully good judge on Top Chef. Here's the video. The second episode of Season 9 of Hell's Kitchen, the Fox series starring chef Gordon Ramsay, cemented the breakout-star role of Dallas contestant Carrie Keep, a chef at Nosh Euro Bistro. She cooks, she fights, she flirts, she smokes. The show started with a steak challenge, which the guys won. For a reward, they went to Palm Springs; for a penance, the girls had to clean grills, do prep work, and drink meat. What? They had to drink pureed meat. Brendan and Carrie had an episode of flirting, smoking, and drinking, then it was on to dinner service. No walk-outs, but the guys had a meltdown, while the girls won. Brendan was sent home. LL: It was a good start, with each team having to cook steaks four ways: medium rare, medium, medium well, and a burger well done. TG: That's a clever challenge, it being such a kitchen basic. LL: I missed how Carrie (who is NOT viewed favorably on Facebook) and Elise got paired in the meat challenge. TG: I'm thinking they got paired because they would provide the biggest drama. LL: They were the big fall down, with their non-stop fighting. So the guys got to go to Palm Springs for lunch while girls drank the meat that had been pureed. TG: That's disgusting, right? Not just my aversion to meat. LL: Yes, the pureed stuff was nasty. TG: What a weird "penance." I think that part of the show is stupid. It turns it into a circus. LL: Carrie actually seemed to like the meat puree. TG: They definitely went out of their way to show her drinking it. And then at the beginning, when they showed her putting on her shirt, and then showing up for the challenge in shorts. Camera angle up and down her legs, etc. LL: And then that night she and Brenden spent the night flirting, drinking, and smoking. Not viewed favorably by anyone on or off the set. TG: Interesting that he ended up being the loser. It seemed like he was a decent cook. LL: He was sent home basically for lying. Carrie and Elise are certainly the big personalities and are being set up as rivals. Elise was being Big Shot during dinner service and ordering everyone around and even pointed her tongs at Ramsay once. TG: I'm beginning to wonder ... who exactly IS this Carrie Keep? I try to keep up on the local chef scene, but she is coming out of nowhere. LL: She can cook. She was the dominant player when the girls went to the guys side to finish it out. It is hard to tell with the editing, but she is certainly special in one way or another. Time will tell.